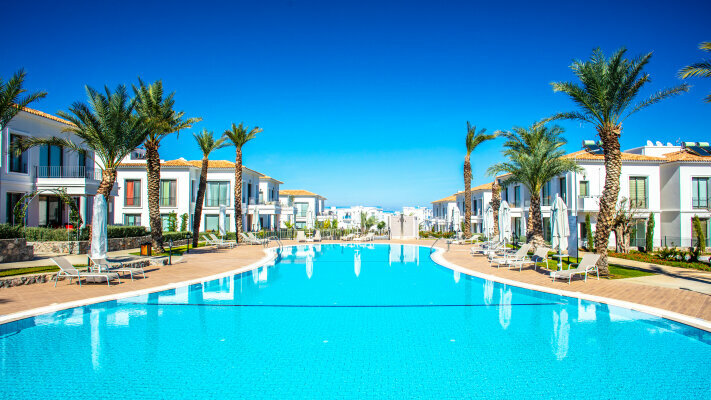 This environmental and nature friendly project is located within 2 minutes distance from the main street, 3 minutes from the beach and 10 minutes drive to the city centre of Kyrenia. Project is surrounded by the first Nature Park in TRNC in the East and Milos Forest in the West. It has a 100% accessibility for the disabled. In each block there are 4 flats on the ground floor with their own private gardens and 4 on the first floor. In general, all apartments are designed to overlook the mountains and the sea. • 24/7 security personal at the entrance point for the site. Stops for public transport are within a short walking distance from the site. School buses for all private schools are available just outside your house.